I have completed training as a level 4 accredited TalkTools therapist. This specialist training enables me to work with a wide range of children and adults with oral sensory and motor difficulties that affect their speech and / or their eating and drinking. I love working with this therapy programme and see clients across the UK as well as offering consultations in Switzerland and France. I am also experienced at working with children and adults who have an ABA team working with them, or who communicate with AAC systems (communication aids and associated technology). In my role as a Makaton Regional tutor I also work with people who use sign language and I am qualified to teach a range of Makaton workshops. I have in depth experience of working within multi disciplinary teams including working with case managers and solicitors. I have experience of the litigation process as an expert witness for EHCP tribunals and medical legal cases. 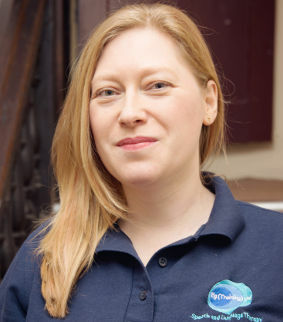 I have extensive experience in supervising other therapists, including NQP's working through their RCSLT competencies, therapists developing specialist skills in dysphagia and TalkTools OPT and therapists wanting to run their own independent practice. To carry out my day to day role I need to be very organised and efficient way and an excellent communicator. I set up Eg (Training) Ltd in 2003 and since this time I have been the director of this independent Speech and Language Therapy services provider. In this role I oversee the management of a growing portfolio of individual and contract work, and supervise the work of a team of speech and language therapists who are employed by Eg (Training) Ltd. I continue to work as a practising Speech and Language Therapist and have an active caseload. Prior to working as an independent therapist I worked in the NHS as a Speech and Languageherapist for 6 years and so have a perspective of working with both statutory and independent services. Family and work life are closely combined as my husband and I are joint directors of Eg (Training) Ltd and both take an active role in running the business. We have two teenage children and try to do activities as a family when we can. You could describe me as a foodie, a geek and a petrol head! I particularly love French and Italian food, making and wearing Steampunk costumes and all sorts of cars and bikes including our 1984 VW camper van. Working as part of a team of independent speech and language therapists allows me to access regular supervision and support. Within our team we access a wide range of training and CPD activities, and then share these experiences across the team in our monthly team CPD sessions. As part of my role I provide supervision services to other independent speech and language therapist including newly qualified therapists. Registered with the Health and Care Professions Council (HCPC). Registered member of Royal College of Speech and Language Therapists. Registered member of Association of Speech and Language Therapists in Independent Practice.